Recent frigid temperatures aside, spring 2018 officially starts in less than a week. While it is not the coldest approach to the spring equinox, it is certainly in the top five in recent memory for a low temperature beginning to the warm season. The almost sultry thermometer readings in February gave everyone a physical and visual sampling of the days soon to come. While a few residents were hoping the groundhog’s prediction of cold for six more weeks, most were happy to see the cold retreat. The warmer temperatures brought out the blooms in both the landscapes and wild areas of north Florida. Crabapple, redbud and maple bloomed along with azaleas, loropetalum and many others which surround homes and businesses. The higher temperatures have also reactivated the insect population. They, for the most part, are not nearly as colorful as the flowering trees and plants. Some butterflies and moths aside, one six legged native stands out for its metallic interpretation of a candy apple green finish. The pollinators with panache are sweat bees. Also known as Halictid bees, they can vary greatly in appearance. The majority of them are dull to metallic black, with the remaining species being metallic green, blue or purple. Adult sweat bees are frequently seen on blooms. Nectar is a major source of food for these mature insects, but they also have a need for human perspiration. While these bees do not sweat, they are attracted to human perspiration sweat which can be disconcerting when the behavior is encountered the first time. These non-aggressive insects use the salt from the sweat for their nutritional needs. Sweat bees are very important pollinators for many wildflowers and crops, including stone fruits, pears, loquats and field crops. This native bee’s population is also supported by wildflower plantings and by providing nesting areas. Halictids typically nest in bare soil located in a sunny location. Minimum use of insecticides and ground disturbances will help to increase populations of Halictidae and other native soil nesting bees. Most halictids nest underground, however nests which are built in rotting wood usually resemble ground nests. Nest architecture of sweat bees in rotting rood is eratic because of the timber’s irregular configuration. Cells containing an egg or larva usually are lined with a waxy substance extruded from gland on the underside of the bee’s abdomen. These bees help speed the decay and decomposition of deadfall trunks and large branches. North Florida’s Halictids overwinter as mated adult females. In the spring or summer, the females emerge, mate if they have not already done so, and begin digging nests and provisioning cells with pollen and nectar. In each cell they lay a single egg. When the larva emerges from the egg, it consumes the pollen provision until gone and they must become self-sufficient and locate a suitable food source. Adult males usually resemble females of the same species, except the guys are often more slender. 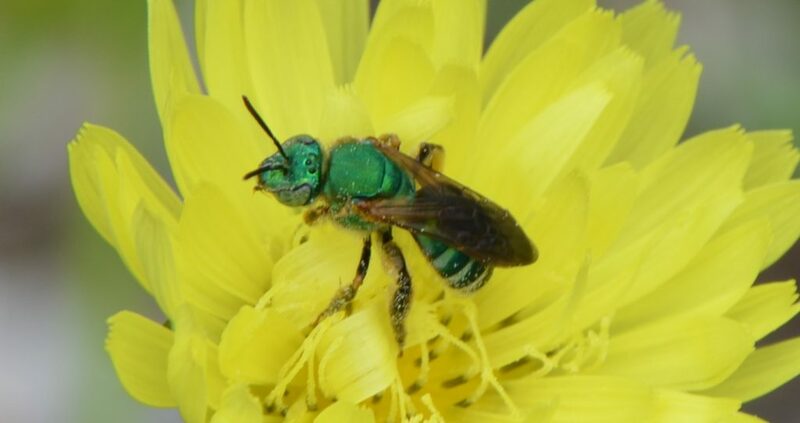 The boy sweat bees do not have an area of long dense hairs on hind leg used for carrying pollen and sometimes have a yellow spot below the antennae on the its face. Once the thaw of 2018 finally occurs and the bloom starts again, these technicolor bees will emerge and add to spring’s brilliance.